Phase one of construction on RIT Dubai’s new campus in the Dubai Silicon Oasis commenced with a special ceremony featuring officials from RIT and the United Arab Emirates. 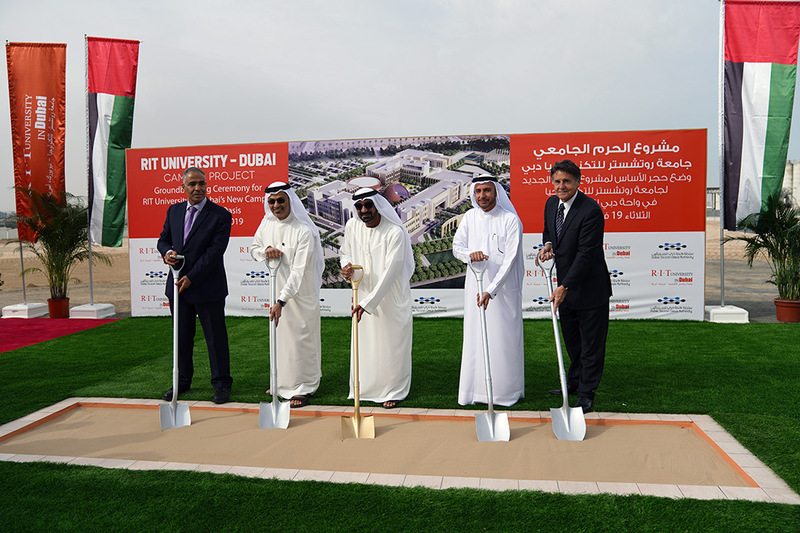 Ground broke on RIT Dubai’s state-of-the-art new campus in the Dubai Silicon Oasis on Tuesday. The new campus, which will feature an innovation and entrepreneurship center and sustainable building processes, will be developed in two phases. Phase one of the project will span more than seven acres and is scheduled to be completed early in 2020. Phase two is scheduled for handover in 2023, adding more than 28 acres to the campus. The United Arab Emirates government is funding the approximately $136 million project. Since launching in 2008, RIT Dubai’s enrollment has grown steadily. In the fall, RIT Dubai enrollment grew to more than 600 students, but the new campus will be able to accommodate up to 4,000. The state-of-the-art academic complex will house five colleges – Electrical Engineering and Computing, Mechanical and Industrial Engineering, Business Administration, Sciences, and Humanities.